Make animation easier with simpler to navigate hierarchies. 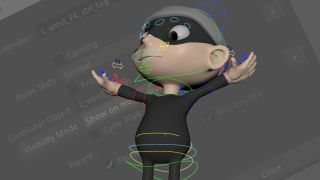 This Maya tutorial will show you how to build custom rigs. The best rigs are the ones that are intuitive and simple to use. When building them you must remember that it’s possible it will be used by a whole team of animators, all of which will have their preferred approach to bringing things to life. What this will do is add a new 'tag' node to the controller. This is where all the information is stored and it offers a few extra options for you when it comes to dictating how your pick-walking works. You will also notice that there currently isn’t a parent defined for each node, so nothing will happen yet. If you’re lucky enough to have Maya 2018 you will also have the ability to change a control's visibility based on the location of the mouse pointer. This can seem strange to begin with as when loaded, the character will appear to have no controls. Ant Ward will be at Vertex answering your questions, as part of our 'Ask an Artist' section. These sessions are a fantastic opportunity to get one to one with a veteran artist, who can help you overcome a roadblock in your work, or to talk through a problem area.